It's been nearly a decade, but BT is officially returning to mobile. After months of talks, the landline and broadband giant has confirmed it will pay £12.5 billion to acquire EE, the UK's biggest operator. In an announcement, BT said it intends to provide customers with "innovative, seamless services that combine the power of fibre broadband with wi-fi and advanced mobile capabilities," targeting EE customers that don't already use its broadband services and delivering 4G connectivity to BT customers for the first time. As part of the deal, EE's original owners, Deutsche Telekom and Orange, will gain shares of BT. Deutsche Telekom will own a 12 percent stake of the company, while Orange will grab 4 percent. 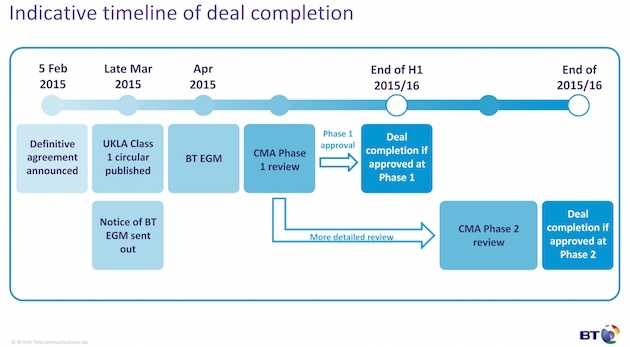 That is, of course, after the deal closes, which BT thinks will be completed by the end of the year. First, it must navigate choppy regulatory waters, which include scrutiny from both the UK Competition and Markets Authority and communications regulator Ofcom. Since BT confirmed it was looking to get back into mobile, interest also picked up in Telefonica-owned carrier O2. Three UK owner Hutchison Whampoa is currently in talks to buy the carrier in a £10.25 billion deal, which would allow the merged company to usurp BT/EE and instantly become the biggest carrier. For EE customers, it's now a case of waiting. The necessary approvals will take time, meaning BT won't make any changes to its services, at least for now. That isn't to say that BT won't mix things up in the future, though. With a healthy landline, broadband and emergent TV business, a new mobile offering will make BT a true quad-play provider. That's something Sky and TalkTalk are already focusing heavily on, but with the help of O2. Overall, quad-play services could mean more competition, which will ultimately benefit consumers. However, as it's likely that the UK mobile industry will shrink from four major players to just three, there could be less incentive for BT/EE, Three/O2 and Vodafone to outprice their mobile rivals. With today's deal likely to close towards the end of the year and Sky set to launch its own mobile network in 2016, we'll have to wait a little while to see how it all pans out.